Revolutionary Cuba is sending 165 volunteer doctors and nurses to Sierra Leone to combat Ebola. Some 4,000 Cuban health-care workers are in Africa. Above, Cuban doctor in Tanzania. The revolutionary government of Cuba is sending a 165-member medical team to Sierra Leone to combat the outbreak of Ebola in West Africa. This is the largest number of medical personnel being sent to West Africa from anywhere in the world. Like other internationalist aid from Cuba since working people took power following the 1959 revolution, the mission to combat Ebola “is carried out under the principle that we don’t give what we have left over; we share what we have,” Cuba’s Public Health Minister Roberto Morales said at a Sept. 12 press conference in Geneva. Morales said that Cuba currently has 50,731 volunteer health care workers in 66 countries, 4,000 of them in Africa. About 20 percent of Cuba’s 75,000 doctors are currently engaged in volunteer internationalist missions. Margaret Chan, director general of the World Health Organization, told reporters at the press conference that there are only about 170 foreign health care workers — including doctors, nurses and disease control specialists — in Africa combating Ebola. The Cuban contingent of 62 doctors and 103 nurses, which will arrive at the beginning of October, will double the number of medical personnel working directly on treating those infected with the disease. The Cuban volunteers are getting specialized training in Cuba to prepare to effectively deal with the deadly disease, which is spread mainly through contact with body fluids. Liberia, Sierra Leone and Guinea-Conakry have less than one or two doctors for every 100,000 people. Reporters in Geneva asked Morales why Cuba was sending the brigade to Sierra Leone. Cuba already has 23 health care workers in Sierra Leone, who have been there for years, and 16 in Guinea-Conakry. “That facilitates the work that can be done there,” Morales said. When the Ebola epidemic broke out, Cuba kept all of its medical workers in Africa. 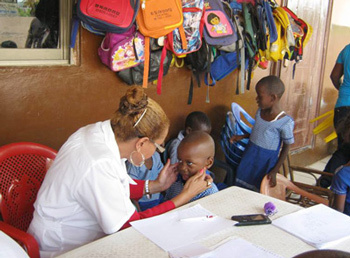 At the same time, the U.S. government’s Peace Corps evacuated all 340 of its personnel in Guinea, Liberia and Sierra Leone, including all health education workers. The Connecticut-based Heartt Foundation pulled out its four U.S. doctors from Liberia after the epidemic began. Boston-based Wellbody Alliance did the same. The Pentagon announced Sept. 8 that it is sending a 25-bed field hospital for treatment of local medical workers in Liberia, not the general population. No U.S. doctors will staff it. After Cuba’s aid announcement received wide publicity, President Barack Obama said Washington would send U.S. military engineers and teachers to train health care workers in Liberia.